SKU: BZ_PR10. Categories: Large Room Air Purifiers, Room Air Purifiers. 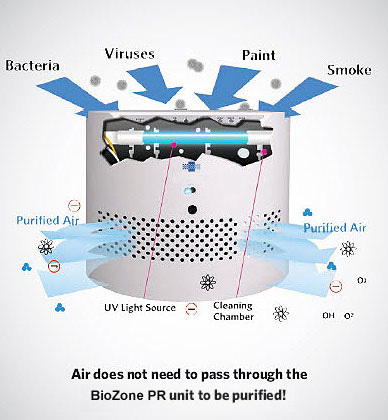 The (Biozone PR10) BZ_PR10 large room air purifier is our most popular home air purifier. Ideal for a large room or your apartment, small home and office up to 1,000 square feet. Safely removes odors, harmful bacteria, viruses, mold and other elements from your home. There are five ways of air purification which makes them the best indoor air purifiers on the market today. Biozone Scientific’s PureWave™ & UltraPure™ technology creates a true smoke eater clinically proven to remove more cigar and cigarette smoke odor. They are proven to eliminate harmful mold, bacteria, viruses, germs, smoke and pet odors more than any other indoor air purifier on the market. These are electrically charged particles which have gained or lost electrons. Negatively charged ions have excess amounts of electrons giving them a negative charge.Biozone’s devices are creating these negative ions and they float around in the air interacting with chemical compounds and micro-organisms. They attach themselves to the airborne contaminants in the room and destroy them. Along with Ozone they contribute to Hydroxyl radical formation which is one of the most effective antiseptic species. Ozone is a gaseous compound that is normally found in the atmosphere. 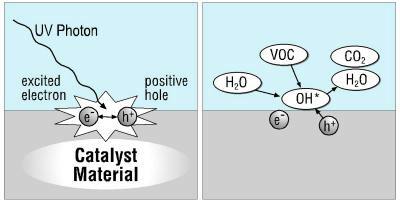 It is being produced by the reaction between Oxygen and UV-light. It is formed of three oxygen atoms. It is a bi-product of this whole process and the amounts generated are managed through the use of custom-designed, dual-purpose UV lamps, therefore blocking part of the UVC spectrum that contributes to a higher production of Ozone.Ozone’s properties as a bactericide, viricide, fungicide, and deodorizer are well accepted by the scientific community. It can effectively and efficiently be used for killing harmful micro-organisms and destroying harmful substances such as VOC’s. Once the air has been cleaned by the Biozone you might notice a clean smell in the room. This means the Biozone has done its job. For this reason, make sure you don’t get a unit that covers a lot larger area than what you have in any given room. The smell can become overwhelming if the unit is too large for the area. On the other hand, if you have an open floor plan you could get by with one larger unit. Or you could decide to purchase an induct unit which will evenly distribute the output into each individual room through your home’s HVAC system. The following guide will help you in deciding what size of purifier is right for you. 5 Strong Odors, Moderate VOC’s, Multiple Smokers and/or ongoing contamination problems. Restaurants, Hair Salons, Pet Stores, Veterinarian Offices, etc. 6 to 10 Extreme Odors, heavy VOC’s, Bars with heavy smoke, Nail Salons, Commercial Chemical or Animal Areas, etc.